Archivists in Somerset have begun the complex and weighty task of listing The Luttrell Collection, to better improve access to the collection. As the second biggest estate collection held by Somerset Archives and Local Studies, the Luttrell papers amount to over 11 cubic meters, and spans from the 12th to the 20th century. The archive includes historical records of the de Mohun and Luttrell families of Dunster Castle, and is particularly rich in manorial records, including court and compotus rolls, but also documents the administration of the estates across West Somerset. While being an exceptionally rich source for local history, the collection also touches on wider national history in several places. 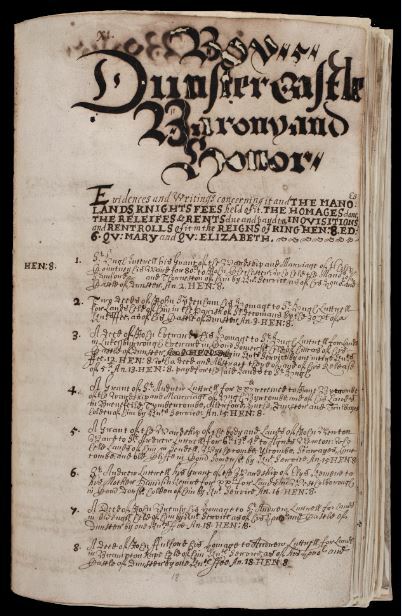 Draft lists already exist for the collection, but these are based on the storage of the collection in the muniments rooms of Dunster Castle, and are not always the easiest to understand for a modern researcher accessing the collections in our searchroom. Our listing will work hard to ensure the original order, hierarchies and structures of the collection are maintained, whilst improving the detail of descriptions and the integration of the existing information with modern archival standards and requirements. The complete catalogue will be made available online, enabling people across the world to tap into this rich archive. The Luttrell archive was accepted by HM Government in Lieu of Inheritance Tax by H M Government from the Trustees of Sir Walter Luttrell’s Will Trust and allocated to Somerset Heritage Centre, 2016.